Many students today are recognizing that there is more to education than lectures, essays and exams. Some of the most important lessons can be learned by investing time outside the classroom walls, in communities across Canada and around the world. When I was a student I spent a year studying abroad in France. I received a specific scholarship for international business studies which paid for my flight and residence overseas. Studying in a different environment was a valuable experience. I also used the opportunity to travel throughout Europe and learned a lot by visiting the various cultures. There are programs available that give students the opportunity to travel and make a difference in the world. 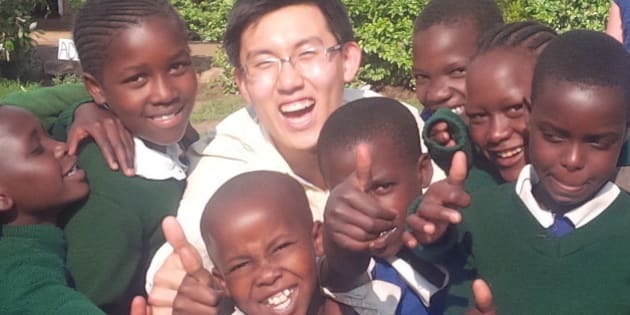 David Kim was the recipient of the RBC Students Leading Change Medical Scholarship in 2013. As part of the scholarship, David volunteered with ME to WE, a program that helps to create clean water sources, build much needed facilities and provide an opportunity to learn about health care and education. "Going to Kenya was simply life changing. I was given the opportunity to visit a rural village and work alongside physicians at the Baraka Health Clinic. This journey truly opened my eyes to the disparity that exists in the world, not only in healthcare, but in many other aspects of life. Seeing patients with incredibly advanced diseases due to lack of care, even though the illnesses were preventable, made me feel quite defeated. However, I was continually astonished by the work of the health professionals -- even in tough times with limited resources, they carried out their work with such compassion and grace. I left Kenya empowered by their optimism and perseverance. In the context of 21st century education, I believe it is becoming more and more important for the learner to step outside of the walls of the classroom to engage themselves in their communities. This is really where one learns how to apply textbook material to the real world while also making a difference by giving back. There are things you simply cannot learn within the confines of the classroom, only by doing. Learning this helped me to be a better student and person." David is a fourth-year medical student at the University of British Columbia where he applies the experience he gained outside of the classroom to his daily studies. David's story demonstrates the value that experiences beyond the classroom can make to students as they continue their studies and plan their careers. Look for scholarship programs in your area of study. For example, the Me to We program has a focus on healthcare and education. But if you can't find one, volunteering still provides valuable experience and transferable skills you can apply to your chosen discipline. 2. Create a professional online presence. In addition to reviewing your application, decision makers will often go online to check out candidates so be sure your social media profiles present you in the best possible way, removing photos and posts if necessary. 3. Customize your application responses. Read the application instructions carefully to understand the goals of the program and respond accordingly. While it may take extra time to tailor your answers in this way, it will distinguish you from the competition. Applications for the RBC Students Leading Change Scholarships are being accepted now until Feb. 23, 2016. There are 15 scholarships available, each worth $10,000. Since 2007, 111 scholarships have been granted for a total of $1,350,000. In today's competitive workplace, many students are finding that earning a degree is not enough to land their dream job. Giving back to your community and gaining experiences beyond the classroom walls not only builds your confidence, but also helps you stand out from the crowd.